Roshani, Parisa, Habibi, Kyoumars, Saeideh Zarabadi, Zahra Sadat. (1396). Designing a Conceptual Pattern to Integrate Urban Spaces Network with the View of “New Urbanism”, Using F’ANP Model, Case Study: District 6 of Tehran. معماری و شهرسازی آرمان شهر, 10(20), 91-103. Parisa Roshani; Kyoumars Habibi; Zahra Sadat Saeideh Zarabadi. "Designing a Conceptual Pattern to Integrate Urban Spaces Network with the View of “New Urbanism”, Using F’ANP Model, Case Study: District 6 of Tehran". معماری و شهرسازی آرمان شهر, 10, 20, 1396, 91-103. Roshani, Parisa, Habibi, Kyoumars, Saeideh Zarabadi, Zahra Sadat. (1396). 'Designing a Conceptual Pattern to Integrate Urban Spaces Network with the View of “New Urbanism”, Using F’ANP Model, Case Study: District 6 of Tehran', معماری و شهرسازی آرمان شهر, 10(20), pp. 91-103. Roshani, Parisa, Habibi, Kyoumars, Saeideh Zarabadi, Zahra Sadat. Designing a Conceptual Pattern to Integrate Urban Spaces Network with the View of “New Urbanism”, Using F’ANP Model, Case Study: District 6 of Tehran. معماری و شهرسازی آرمان شهر, 1396; 10(20): 91-103. 1Ph.D. Candidate of Urban Planning, Department of Urban Planning, Faculty of Art and Architecture, Science and Research Branch, Islamic Azad University, Tehran, Iran. 2Associate Professor of Urbanism, Department of Urban Planning, University of Kurdistan, Sanandaj, Iran. 3Associate Professor of Urban Planning, Department of Urban Planning, Faculty Art and Architecture, Science and Research Branch, Islamic Azad University, Tehran, Iran. the structure of city and make it integrated; bring about the socio-economic growth and prosperity for inhabitant. Therefore, the present study seeks to explore the factors influencing the interconnected urban spaces network in addition to propose a conceptual model for shaping it. The research is exploratoryexplanatory and uses meta-analysis method for its planning process. Moreover, for analytical evaluation of case model, F’ANP model is employed. The main approach in this analysis is based on the movement of “new urbanism”. The research results reveal that urban spaces are located in a logic network in form of transects in order to achieve spatial integrity, continuity in the transverse sections of the city must be maintained, which is provided in the form of a continuity matrix. Summing up, in compare with the different researchers views, 9 indexes of spatial integrity were obtained include combination of social, functional, physical and visual aspects of theorists. Alexander, C. (2000). The Nature of Order. New York: Oxford University Press. Alexander, C., Ishikawa, S., Silverstein, M., Jacobson, M., Fiksdahl-King, I., & Angel, S. (1977). A Pattern Language .New York, Oxford University Press. Alexander, C., Neis, H., Anninou, A. & King, I (1987). A New Theory of Urban Design. New York: Oxford University Press. Barnett, J. (2014). Do Not Define Urban Design too Narrowly, Journal of Urban Design, 19(1), 49–52. Bucys, J. (2012), Understanding Coherence between Functional and Compositional Structures of the City: A Case Study of Local Centers in Vilnius, Eighth International Space Syntax Symposium, Santiago de Chile: PUC, 1-8. Carmona, M. (2010). Contemporary Public Space: Critique and Classification, Part One: Critique. Journal of Urban Design, 15(2), 157-173. Carmona, M. (2014). The Place-shaping Continuum: A Theory of Urban Design Process, Journal of Urban Design, 19(1), 2-36. Carmona, M., Health, T., Oc, T., & Tiesdell, S. (2003). Public Places-Urban Spaces: The Dimension of Urban Design. New York: Architectural Press. Development Bureau Report. (2012). Public Open Space in Private Developments Design and Management Guidelines, 18-19. Ellin, N. (2006). Integral Urbanism. New York: Routledge. Im Sik, C., Zdravko, T., & Ivan, N. (2015). Towards an Integrated Urban Space Framework for Emerging Urban Conditions in a High-density Context, Journal of Urban Design, 20(2), 147–168. Lynch, K. (2004). City View, (Manouchehr, M., Trans.). Tehran, Iran, Tehran University. Pourjafar, MR., Ismailian, S. (2013). In Search of Structural Criteria of Urban Spaces Network in the Historical Context of Iran; Case Study: Isfahan, Dardasht. Urban Management, 31, 65-82. Rahnama, MR., Roshani, P., Hasani, A., & Hosein, H. (2012). Use Principles of New Urbanism Approach in Designing Sustainable Urban Spaces, International Journal of Applied Science and Technology, 2(7), 195-204. Rahnama, MR., Roushani, P., & Afshari, M. (2013). Increasing Quality of Modern Urban Neighborhoods by Using an Urbanism Approach, Case Study: Azadshahr in Mashhad, Journal of Geography and Urban Development, 3, 27-46. Salingaros, N.A. (2000). Complexity and Urban Coherence. Journal of Urban Design, 5, 291-316. Smart Code. (2009). Version 9.2. Stiles, R. (2010). A Guideline for Making Space. Institute for Urban Design and Landscape Architecture, University of Technology, Vienna, 9-12. Tavassoly, M., & Bonyadi, N. (1991). Design of Urban Space, Center of Planning and Architecture Studies, Tehran, Iran. The Lexicon of the New Urbanism. (2014). Duany- platter, Zyberk & Company, Version 9. Varna, G., & Tiesdell, S. (2010). Assessing the Publicness of Public Space: The Star Model of Publicness. Journal of Urban Design, 15 (4), 575–598. Zebardast, E., & Emami, M. (2014). Evaluation of Urban Development Plans Based on Interconnections Principles and Using ANP Method. 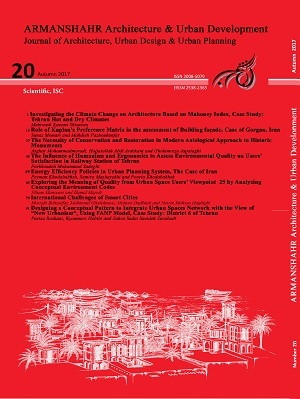 Science and Research Journal of Urban Studies, 11, 21-38.